The Nitro Piston Elite system features an upgraded Powerplant and all-new, enhanced Clean Break Trigger (CBT). Built & Assembled in the USA. 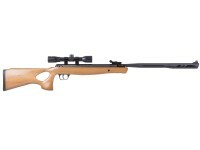 Own the backyard range with the Crosman Valiant SBD. This silenced breakbarrel makes for an ideal choice for a backyard friendly breakbarrel for blasting targets, and dispatching pests. Loaded with Crosman’s latest technology, the Valiant sports a hardwood thumbhole stock, and makes use of an improved Silencing Barrel Device (SBD)–an innovative suppressor design that keeps its shots 3x quieter than other breakbarrels in its class. The SBD feature certainly comes in handy at quieting the powerful Nitro Piston Elite powerplant. This lethal gas-piston is specially designed to provide shooters with 15% more speed, 35% more power, and 2x the accuracy of standard gas pistons. This improved power system translates to up to 23 FPE in .177 caliber, and 29 FPE of muzzle energy in .22. Release all this energy with a pull of the Clean Break Trigger (CBT), a 2-stage adjustable that can be customized to your preferred pull. Once locked and loaded, you can expect lead pellet velocities from you can expect lead velocities up to 1150 fps in .177, and 950 in .22. 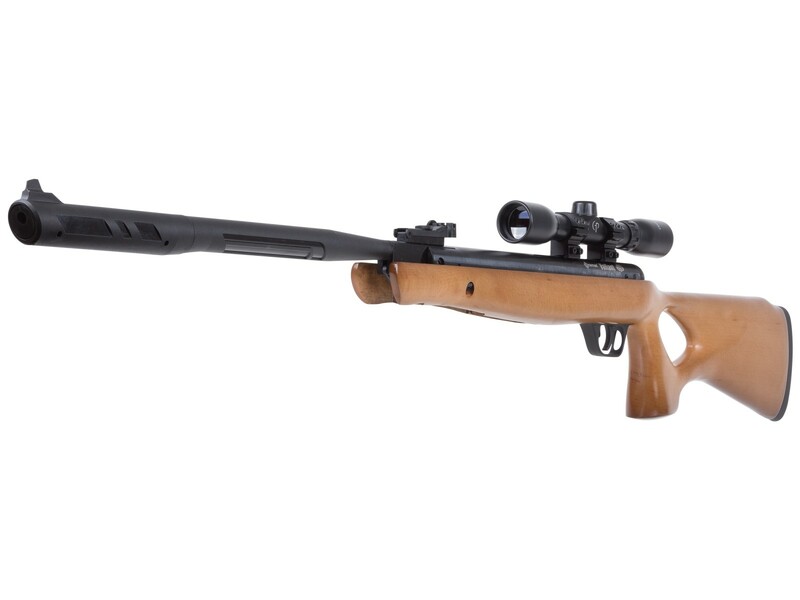 The Valiant includes a CenterPoint 4x32 scope for mounting to its 11mm Dovetail rail. For those who want to get started shooting immediately, the Valiant also includes open sights with a fully adjustable rear sight. If you want an easy to use shooter that keeps the shots high-powered and quiet, choose the Valiant for hours of backyard plinking fun. 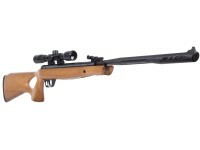 Things I liked: The Crosman Valiant SBD Air Rifle, Nitro Piston Elite, .22, packs a nice little punch. Sure there's larger caliber and more powerful, but in this price point, I really see no downside to this rifle. I purchased this to step up from a .177, and I'm glad I did. The wood is far from spectacular, but it is good and looks great. Siting was quick, and so far, even during break in, it seems to be very accurate and consistent. In addition, I'm glad I went through Pyramyd Air, for my purchase. They are responsive and quick to resolve issues. I'm glad I went through them and not settled for what the box stores had in stock. Things I would have changed: Crosman quality control may have an issue or two. My scope mounts were missing screws, but Pyramyd Air was top notch and corrected the issue with replacement mounts. With the help of Pyramyd Air in this matter, I decided to maintain the five stars. What others should know: I would definitely recommend this as a daily/entry level rifle. I am far from an experienced airgunner, but am new and interested in what's out there. It took a little time before committing to this rifle, but I'm glad I did. Things I liked: Love the price. This rifle can be accurate if you take the time to learn how they work and how to hold them. Growing up with a multi-pump, changing to a CO2 and later purchasing a PCP the breakbarrel has fast become my favorite hunting rifle. Things I would have changed: I did change the scope. There were too many bad reviews to bother mounting it. Changed the trigger spring with an M-CARBO trigger kit for the Benjamin line. What others should know: Crosman did a POOR job assembling this rifle and used substandard fasteners for an air rifle with type of recoil. I had to remove the stock to install the trigger kit. Best thing I ever did...all three bolts holding the barrel to the stock were loose. Two screws near the end of the stock were not finger tight. I only wish the assembly and torque specs were available. Things I liked: Very accurate with the open sights and pretty quiet, it seems to have a lot of power. I have only shot about 60 or 70 rounds through it but so far I really like it. Things I would have changed: The only things I Think i would change is it would be better with fiber optic sights and mabe a picatinny rail because the dovetail mount lets the scope slide back from the recoil. Does this rifle come with any type of lubercant.? What is the cocking effort for this rifle? 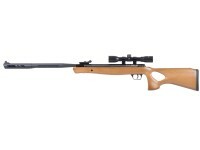 what is the sound level of this airgun?